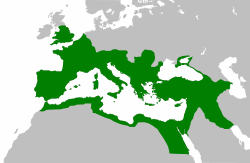 The Roman Empire (Latin: imperium romanum) was the largest empire of the ancient world. Its capital was Rome, and its empire was based on the Mediterranean. The Empire dates from 27 BC, when Octavian became the Emperor, Augustus. The empire was the third stage of Ancient Rome. Rome was first ruled by kings, then by the Roman Republic, then by an emperor. Many modern lands were once part of the Roman Empire, including Britain (not Scotland), Spain, Portugal, France, Italy, Greece, Turkey, Germany, Egypt, and the north coast of Africa. The main language of the Roman Empire was Latin; Greek was an important secondary language. The western part of the Roman Empire continued for about 500 years, and the eastern part, including Greece and Turkey, continued for about a thousand years more. The eastern part was called the Byzantine Empire with a capital at Constantinople. In order to control their large empire, the Romans developed important ideas about law and government. They developed the best army in the world at that time, and ruled by force. They had fine engineering, and built roads, cities, and outstanding buildings. The Empire was divided into provinces, each with a governor plus civil and military support. Letters, both official and private, would constantly go to and from Rome. Trade was most important for Rome, a city of more than a million people, by far the largest city in the world. They needed, and got, wheat from Egypt, tin from Britannia, grapes from Gaul, and so on. In return, the Romans built provincial capitals into fine cities, protected them from raids by barbarians, and provided education and career opportunities for young people in the provinces, such as careers in the Roman army. In principle, emperors had absolute control, and could do as they pleased. In practice, they faced many difficult problems. They had a staff of what we call 'civil servants' and the advice of the Roman Senate. The emperor had to decide what were the most important issues facing the Empire, and what should be done about them. Most of them tried to do two sorts of thing. One was to do things to improve the life of Romans in peacetime. The other was to fight and defeat Rome's enemies. A wealthy empire always has enemies. With kings and emperors, a big problem is the order of succession. Who follows them when they die? Kings were sometimes followed by their eldest son, if he was capable of ruling. For Roman emperors, more often it would be an adopted son. It worked like this. The emperor would notice an outstanding young man from one of the best families. He would adopt him as his son. Before he died he would make clear whom he thought should succeed him, by making him a Roman consul, or by stating in his will that the younger man should succeed him. Sometimes this worked; sometimes it did not. Every now and then there would be a civil war between claimants to the throne. An adopted son or two gave the emperor more choices. Some emperors had no son; some had sons who were killed in battle, or died during a plague. Later on, emperors grew so weak that the military would just pick one of their generals to be the next emperor. This often led to civil war. The life stories of the emperors can be found in List of Roman emperors. The Romans fought many wars against other countries, and enjoyed watching violent sports. They enjoyed watching races between chariots pulled by horses, and fights between men using weapons (gladiators). Unlike in modern sports, the fighters were often killed in these fights. Romans enjoyed these shows in the Colosseum. The Romans built many large public buildings and villas, aqueducts to carry water, and good stone bridges and roads. Some of these things can still be seen today. Many famous writers were Romans, including Cicero and Virgil. The New Testament of the Bible tells about the Romans in the life of Jesus Christ. During Jesus' life, the Romans, who were pagans, ruled his country. Later, several emperors tried to destroy Christianity but they did not succeed. By 312 AD the emperor Galerius allowed people freedom to follow Christianity, and the next year, a general, Constantine, became emperor and converted to Christianity. The city of Rome was taken over several times by barbarians, notably in 410 AD when the Goths sacked the city (looting). The last Western Roman emperor, Romulus Augustus, resigned in 476 AD. The Roman Empire would last another 1,000 years as the Byzantine Empire in the east. The main coin of the Roman Empire was the denarius. This page was last changed on 10 November 2014, at 15:42.